Saturday I was traveling home from work in California when I heard that Mike Brown, a teenager in the St. Louis neighborhood called Ferguson, had been shot by a policeman. I wondered what happened and I checked the internet but I kept going about my busy life that is until the riots happening in Ferguson Sunday night slapped me out of it. This morning as I worked, I turned on the local news and watched as people peacefully gathered in Ferguson, I decided the things on my “to do list” were going to be set aside. Instead, I felt like I should join people in Ferguson at least for a bit. I wanted to understand the Ferguson, Missouri riot. 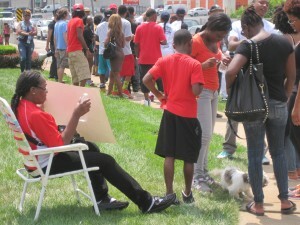 The details are fuzzy… but everyone agrees on the fact that an 18 year old man named Mike Brown was shot by a police man. There are questions surrounding what prompted the interaction, questions about why deadly force was used, questions about how many shots were fired and why, questions about why an ambulance didn’t immediately try to revive Brown, why he was left in the street for hours and more. Last night, friends and I were all watching the Twitter streams, news on TV and conversations popping up on Facebook. What I saw was a divide. There were people who wanted justice now, there were folks who said they couldn’t understand how looting honored Mike Brown’s memory and there were folks who were just asking questions and sending prayers. All of it was just so sad to me that I really was having trouble processing it. Why go to Ferguson today? 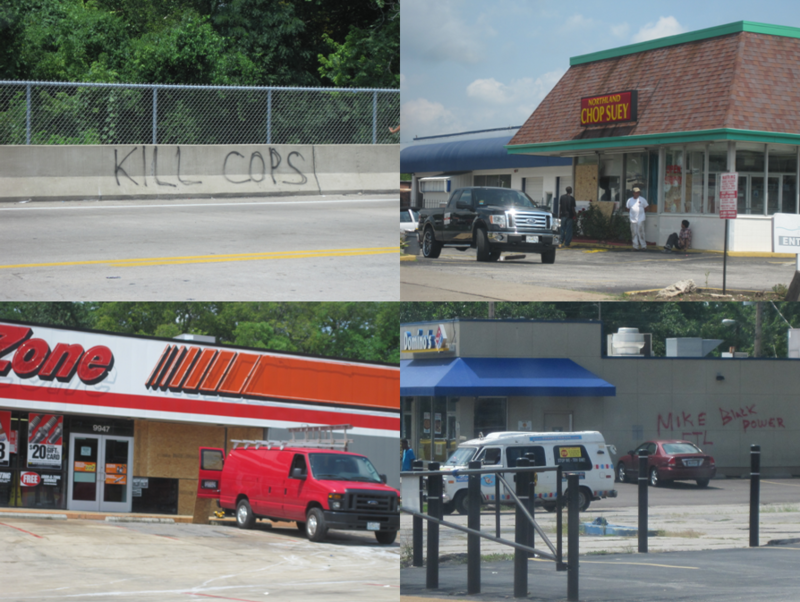 This morning, I saw the damage that had been done in the Ferguson riot. The ways anger had shaped the community. And while everyone else was talking about looting, all I could think about was this quote from Mike Brown’s mom that was in the NY Times. As I looked at the news, I saw mostly black faces. The only white faces I saw were buried behind big cameras or faces of the police. I didn’t see white people simply standing there wondering what happened to Mike. And as people were saying they hoped calmer heads would prevail in Ferguson today, I couldn’t wonder how many would go over there. I thought about how many times we’ve talked about how bloggers need to stand up for what’s right. So I decided to go. I wasn’t sure what I would do when I got there, but I would go. 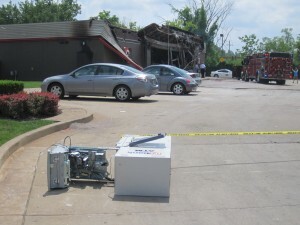 Having moved to St. Louis about three years ago, I have been warned about how rough North County is in a number of ways. The neighborhood is really urban. There are not a lot of white people living there. The economics in the area are different than my U City neighborhood. And yet for me, Ferguson is a lot like areas I have known my whole life. This is a photos from Northside Christian Camp in Memphis. 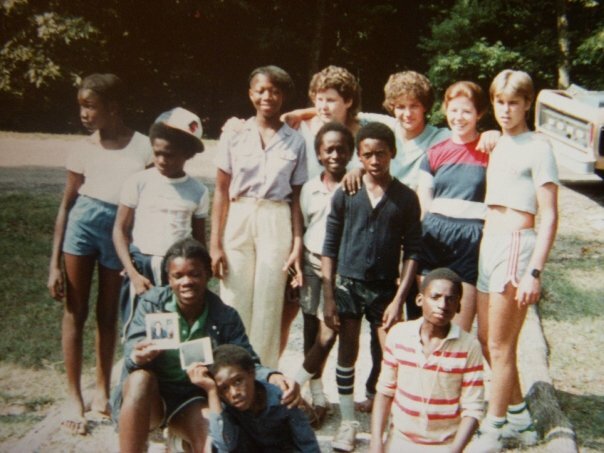 Looking at this photo I wonder where Tyrone, Edna and Andre are, I think of Quenton, Ontario, Laderio and William…. even decades ago, we were trying to help kids see a way out. I have to admit, I had to get a map out to figure out where Ferguson was in North County and then to try and figure out where in Ferguson to head.I decided I could go to Ferguson safely. I chose to carry a small purse, a bottle of water and nothing else. I wanted to be part of the crowd. I wanted to see who was there and why. I wanted to share why I was there. I ate lunch and headed out. I have no idea what happened this weekend. Hopefully the investigation by third parties will help shine a light on it. What I think more people are frustrated by is the fact this can happen and happen again. We can do better for ourselves and each other. We should feel we are treated with respect. We should expect it of others. And we should react with compassion when a mom has lost her son. It is a tragedy and adding to tragedy with destruction of property doesn’t help. But I can understand frustration running so deep that some may not be able to think straight. I understand some of our cities have become rough. And being a cop there can’t be easy. I’m sure some of our people have become hopeless and that is horrible. It must seem like a thankless job at times as people are too afraid to help change the situation. I know police are to protect and serve. We need to figure out how that can best be achieved as a society cause it seems the problem pops up all too often. That makes the frustration here all the more real. They are frustrated about what happened to Mike Brown as well as what the community faces every day. So I was there to simply show with my presence that I agree. We can do better and I want people to know I expect it. Since I’m not at all familiar with the neighborhood, I wasn’t really sure what I was going into. I thought about making sure I had battery power for the phone and parking someplace secure. 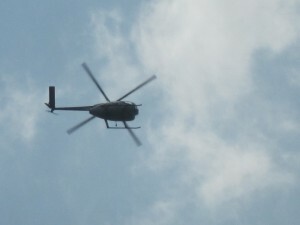 I wasn’t sure I was headed to the right place until traffic got heavier and a helicopter was flying in circles nearby. Then I started seeing buildings hit by looters last night. 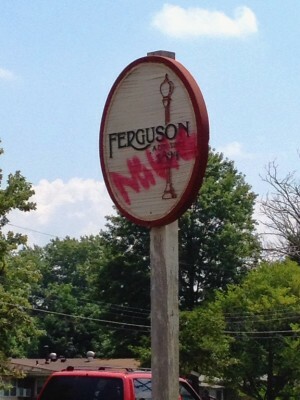 And graffiti that clearly showed the outrage. I’ll share a few pics here for your information. 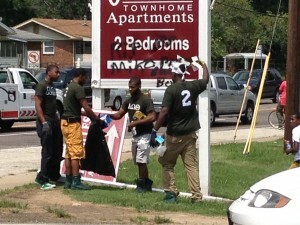 It is more than unsettling to see a neighborhood in this kind of turmoil. There were glass and plywood deliveries being made up and down Flourissant. And there were people on the sidewalks up and down the road. Some of them were clearly on their way to work or to catch a bus and others were kind of hanging out. Eventually I saw the Quick Trip that I had been seeing on the news. It was home to a crowd of people from the neighborhood and a crowd of cops too. I passed and doubled back to find a place to park and in that time a fire alarm was called and police descended. I took my time walking up to the Quick Trip. It didn’t take long til I was soaking up the fact that I was standing near an ATM machine that had been dragged or pushed from the building. I asked why the fire department was back and a woman nearby said the store was still smoking since last night. There were lots of county police between the crowd and the store. They didn’t look tense but sure as hell weren’t relaxed. For the most part, the crowd of people was quiet. People were standing around and more than anything, they wanted answers and change. Families were there. Grandparents, moms, toddlers, teens…. people seemed unsure this was really their neighborhood. I walked around slowly, snapping a few photos now and then and just really looking. Looking at the people’s faces who were there. Looking at the store and graffiti. Looking at the cops. Looking at the cars going by — so many had their phones up taking photos or video. One woman, who had brought a law chair and sat there with a sign saying “no more injustice for unarmed men” saw me wandering and simply said it leaves you speechless. I agreed. Then she said it was just too much having Trayvon Martin and this case both. I agreed. A group from a fraternity came through picking up trash and I had to pause to think about what could have been. Another woman who probably had adult children walked up and was just shaking her head. She finally said the store had been here since she was a kid. Now it was gone. And she asked whether anyone could possibly think that would help. The chants made a comeback after a while with the guy on the megaphone screaming “hands up” and the crowd doing just that while replying “don’t shoot” ( I posted video on Instagram) It was poignant because it seems that sometimes shots get fired quickly. And while I probably don’t represent much of a threat to a police officer, I have had conversations with friends who have made certain their sons know this is the routine. Sons are taught immediately get your hands in the air and reply “don’t shoot” in hopes of making it through. As I left Ferguson, I was thirsty. After getting a few blocks away and seeing an area that looked normal, I pulled into a drive through to get a cold drink. It didn’t take long to realize the business was closed for the day. My guess is they didn’t want to have employees dealing with the Ferguson riot and potential crowds. The gas station nearby was crazy packed probably because the place lots of folks would go was burned and a shell. It will be a long time before normalcy is found and I really hope it is a new improved version of normal. I will never forget my time at Northside! I look for those faces now and then! Thanks for this Janice. The same quote from Michael’s mom touched me too this morning. His parents have been well spoken through such pain. I can’t imagine. Thank you for your voice Janice. Its not much but it is my pleasure. I just shared this on FB. You are awesome. for you to go there, into the “line of fire” to see for yourself what was going on firsthand is commendable. THANK YOU!!!! I didn’t doublethink it really til I was in the car seeing the neighborhood had taken so many hits. I was glad to show up…. I wanted people to see they weren’t alone. Was nice to visit with a few folks for a while even though most of it was in silence. That quote from Mike’s mom haunted me all night. I had to look it back up today…. so much work and one instant changed everything. Hey boo! Unfortunately, this is yet another sad incident for everybody involved. I have more questions than answers right now just like you and others have and sometimes people do just feel….hopeless. I’m glad that you went over there for yourself and showed your support to the community! It is sad all over for sure. Hey, JP, well-written, thoughtful post, as usual. Very sobering, not so usual. As I said in a different social media forum, I’m sad that you’ve never had the occasion to visit Ferguson until now, under these circumstances. Having lived in North County for much of my life, including the last 20 years, I’ll reiterate that the North County we’ve seen on the news this week doesn’t represent the community I know and love. I’d encourage all your St. Louis area readers to check out Ferguson Brewing, Cork Wine Bar, and Whistle Stop frozen custard, among others. Ferguson is going to need a lot of help rebuilding, and patronizing these businesses is a small step we all of us can take to show our support. Agreed Chris. I think we need to look at ways to support the community…. one of the biggest ways may be a radical change in law enforcement IMHO. I hope some folks are trying to figure out how to get a few folks out of office. Lets find time to go to one of those soon! I love your breakdown of your whole experience.